Castle Oaks Garage on Mint Canyon Road (now 12625 Sierra Highway) in the Sleepy Valley section of Agua Dulce. Real photo postcard, 1920s. 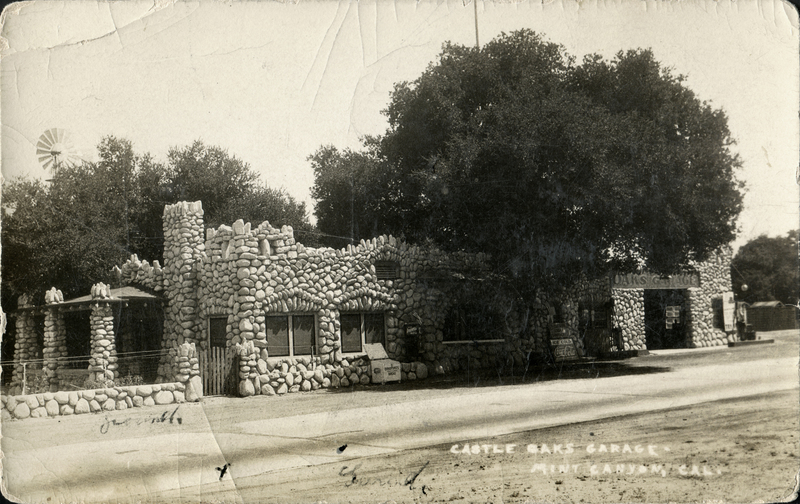 No earlier than 1923, when proprietors William A. and Rachel Dodrill (and Rachel's father, bricklayer Gus Swanson), converted an outdoor lunch counter into an enclosed dining room with outer walls of rounded stone that gave it the appearance of a castle (thus the name, which was truthfully just a nickname). The dining room is seen at left; they also applied the new finish to their 1917 wood-sided auto garage, seen at right. Mint Canyon Road (Sierra Highway) is paved in this photograph. We don't know when the paving occurred, but Spruce Street in Newhall was paved in 1926, and it may have happened around the same time. This is Rachel's house. / Mint Canyon / They have have [sic] a big business running a filling station service garage — and serves lunches. See that window under the live oak tree has a counter [?]. The Highway runs in front all the light is pavement. / Rachel is living in Long Beach during the school year. We don't know the meaning of the last line, but Rachel Dodrill did not have a daughter of the same name, if that's what you were thinking. Rachel Joyce Swanson Dodrill was born April 28, 1893, in Nebraska, and died May 18, 1964, in Shasta County, Calif. Husband William Archibald Dodrill was born Nov. 28, 1888, in Prairie Home, Neb., and died Dec. 6, 1967, also in Shasta County. They are buried together under the same headstone at Fall River Cemetery in Fall River Mills, Shasta County. They had one child, Nellie Elizabeth Dodrill, born Oct. 4, 1921, in Whittier. Nellie (married name: Van Den Bergh) died Feb. 13, 1983, and rests in the same cemetery. LW2647: 19200 dpi jpeg from original RPPC purchased 2014 by Leon Worden.